When my friend Jon Nieporte of Foundation Escalera and I decided that we wanted to go see the Whale Sharks migrating off the coast from Mexico’s Yucatan peninsula I was excited. But, Jon was already in Tulum and I had to figure out a way to get from San Cristobal de las Casas to Isla Holbox, offshore about three hours west of Cancun. Driving the 20 something hours alone wasn’t very appealing and all the flights out of Tuxtla Gutierrez on the day I wanted to go had long connections in Mexico City so decided to try something I hadn’t done before and try out the bus service in Mexico. Now the thought of riding in a cramped seat for 19 hours to Cancun with another three hours tacked on to get to Isla Holbox wasn’t very exciting either but I decided to give it a try. 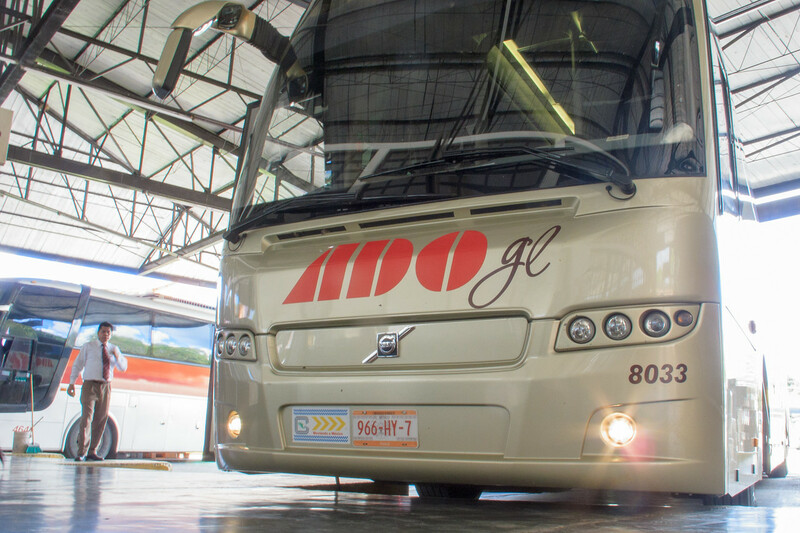 The ticket place on the Guadalupe andador (walking street) had three different departure times and two options; an OCC standard class bus which admittedly looked fine or a relatively new first class service, ADO GL. Since it was going to be a long trip and the GL was only about $10 more than standard I opted to give it a try. I was able to reserve seats and picked one at the front of the bus. One strange thing I noticed was that the OCC buses on the same route advertised about an hour less travel time to Cancun. I arrived at the bus station the next day and was pleasantly surprised to see the huge, shining bus waiting there with the reassuring Cancun destination displayed with a lighted sign in front. I gave my bag to the porter who put it underneath and stopped at a small podium they had set out where you received your headphones and could select from a variety of drinks to take on board. Inside the bus was new, clean and modern looking. It even had that new car smell. My window seat was huge. There was a TV monitor overhead, airline style armrests complete with buttons to control and select the audio and more leg room than I at 6’3” tall could use. I didn’t know how comfortable the ride was going to be but I knew it wasn’t going to be cramped. The bus left on time and began the torturous segment north from San Cristobal toward Palenque. This road twists and turns and there are so many topes (speed bumps) that I think any form of transportation on this road will be uncomfortable. It is to me one of the most beautiful drives on the planet and it was surreal moving through this landscape observing life in Mayan villages from a comfortable seat high in a futuristic looking bus. I did discover why the OCC buses advertised less time en route because they were passing us while flying over the topes while we went very slow and ALMOST floated over them. We stopped for about ten minutes in Occosingo to put off a few passengers and take a bathroom break. There are WCs on the GL but I wouldn’t have dared to use them on that twisting portion of the road. We stopped again in Palenque and the road began to straighten out. I was looking forward to seeing the route of this portion of my original drive into Mexico but the sun was down and I fell asleep and didn’t wake up again until we were in Chetumal about six hours later. The sun was starting to rise and I was now looking forward to seeing the road that I used to drive repeatedly from Chetumal to the turnoff to Xcalak but again I was sleeping like a baby. We stopped again in Tulum and Playa del Carmen and before I knew it I was in Cancun. All in all, I bet I got almost eight hours of sleep en route. Not bad. The bus terminal in Cancun is hot but clean and efficient. I met Jon there and we had to figure out how to get to Chiquilá, three hours west of Cancun to catch the ferry to Isla Holbox. We found a local Mayab bus that was leaving about an hour later and bought tickets. The Mayab bus was air-conditioned and had wheels and everything but not much else. It was crowded, shabby and let’s just say the new car smell had been gone for at least a couple of decades. I did meet a nice couple from the UK who were also headed to Holbox. They were that is, until they tried to help a little old lady who “accidentally” dropped her change near their feet and swiped their bag from the overhead as they tried to help her pick it up. They lost all their phone, money, passports and some essential medications so they had to turn around. Jon called the British Embassy in London and allowed them to use his phone so they could make arrangements to get new passports and money wired. We gave them enough money to get back to Cancun and hopefully buy a meal and more medication. I was sorry to see them leave; they were nice people. We learned a lesson too. Don’t be paranoid but protect your gear and don’t get distracted. Chiquilá was an unremarkable dusty town but there was a ferry waiting when we arrived and about half an hour later we were on Holbox. I had been traveling close to non-stop for 25 hours and was ready for a shower and a nice meal. Luckily Isla Holbox looked like it was going to be a fun place. I didn’t spend much time in Mexico, so I never took a long-haul bus. But it is good to know they are good options.